Today is Halloween, but Friday was the day for elementary school Halloween parties. And on Friday I was invited to Mesa Elementary School, my boys' former elementary school, to speak at their fifth-grade variant of a Halloween party, the Biography Tea, because of my book Being Teddy Roosevelt, inspired by that very event. For the Biography Tea, children come to school dressed as some famous person and impersonate that individual during an elegant tea party. The four main characters in my book dress up as Teddy Roosevelt, Mahatma Gandhi, Hellen Keller, and Queen Elizabeth, and each has his or her life changed in some small but significant way as a result of inhabiting this other identity. This year I saw two Queen Elizabeths, at least one Pocohantas, and one very convincing-looking Abraham Lincoln, as well as a terrific King Tut. I also encountered some wonderful famous people I had never met before: pictured above is Sam Dusinberre as Sousa band trumpeter Herbert L. Clarke. Yay for the Biography Tea! I just heard back from Nancy Hinkel, the editor for my MASON DIXON series that will be coming out next year from Random House, with her comments on the manuscript for the third book in the series, Mason Dixon: Basketball Disasters, following after Mason Dixon: Pet Disasters and Mason Dixon: Fourth Grade Disasters. The good news: she thinks the manuscript is "a delight to read" and generally "swell." The bad news: she thinks the story arc of this one is too much like the story arc of the first two books. Of course, my first thought was: well, that's because it's the third book in a series! In a series there is going to be a certain, shall we say, similarity among the books! In all my Dinah books (Dynamite Dinah, Dinah for President, Dinah in Love, and Dinah Forever), Dinah is a likable narcissist who has her self-love a bit chastened; in all my Gus and Grandpa books, Gus experiences some kind of second-grade problem that Grandpa helps him to solve; and in all the Mason Dixon books, Mason first expresses reluctance to engage in some activity (getting a pet, joining the fourth grade chorus at school, trying a team sport) and then comes around to find himself more enthusiastic than he had expected. But there does seem to be something especially predictable about this standard story arc for the Mason Dixon books, I'm starting to think. And I trust Nancy on this completely. So now my challenge is to find some way to make this third book different, while still making Mason be Mason (curmudgeonly, sarcastic, expecting the worst) and his best friend Brody be Brody (hyper-enthusiastic, sunny, expecting the best). I know I can do it. Heck, it has to be possible or Nancy wouldn't expect me to do it, right? My question right this minute is HOW. Last night I finished teaching a four-week-long Lifelong Learning Class on Children's Book Writing through Boulder Valley Public Schools. For the first session, I went over the format and expectations for all the different categories of children's books - picture books, easy readers, chapter books, middle-grade novels, YA - and we did an in-class writing exercise using a prompt that involved excavating childhood memories. For the second session, I presented material on plot and characterization, and we did a character development exercise that I borrowed from writer Denise Vega: each student is given two cards, one containing a situation (e.g., you didn't get the part you wanted in the class play, your little brother breaks your favorite toy, a boy you don't like asks you to the class dance) and the other containing two different character traits (e.g., determined, selfish, creative, shy, compassionate, clumsy). The challenge is to write a short scene in which the character would deal with the given situation while exhibiting the two character traits. Students then share their work (if willing) and the rest of us have the fun of trying to guess which character traits are being portrayed. For the third session, I talked about writing picture books, since everybody always wants to write picture books even though this is by FAR the hardest form of children's book writing. I also gave them handouts on point of view and do's and don'ts of dialogue, as well as a grab-bag of other craft-related goodies. For the final session, I explained the process of children's book publication - self-publishing versus commercial publishing, agent versus no-agent. I shared information about the wonderful organization SCBWI (Society of Children's Book Writers and Illustrators). I gave out samples of my own synopses to show how a selling synopsis is crafted. For the second half of the class, we critiqued the manuscripts of the three students who were brave enough to bring their work-in-progress to share. I thought it was a pretty good class. In the course evaluations, which I collected that night, the students also thought it was a pretty good class. But they wanted it to go on longer (which is gratifying). And they wanted more on how to get published. Indeed, throughout the course I kept getting questions on how to get published, questions that I kept deferring to our final session: let's first learn how to WRITE the books, then we can learn how to get them published. But everybody always wants to learn how to get published. The writer Anne Lamott is the one who is best on this phenomenon that all teachers of creative writing face. In Bird by Bird, she talks about sharing with her students what the miracle of writing is like, and then her students stare at her for a moment and ask, "How do we find an agent?" She says that "the problem that comes up over and over again is that these people want to be published. They kind of want to write, but they really want to be published." Anne tells them, "You'll never get to where you want to be that way. There is a door we all want to walk through, and writing can help you find it and open it." Now, don't get me wrong. I want to be published, too. I love being published. But Anne Lamott is right. The writing itself comes first. And last. As Anne writes, "[Writing is] like singing on a boat during a terrible storm at sea. You can't stop the raging storm, but singing can change the hearts and spirits of the people who are together on that ship." When I write each book, I always think, maybe THIS is the one: the one to be my "breakout" book, my Newbery medal, my best-seller, my ticket to literary immortality. And guess what: so far, I've always been wrong. But each book ends up garnering some little honor, some small piece of recognition, appealing to some child somewhere. Of all my books, the one that has sold the most copies by far is 7 x 9 = Trouble! When I get my royalty statements twice a year, I usually find that it has sold not only more copies than any of my other books, but often more copies than all the other books put together. I do love this little book, but I don't love it more than its brothers and sisters. So I have no idea why this one has proven to be the most popular of my books. It does have a cute title. 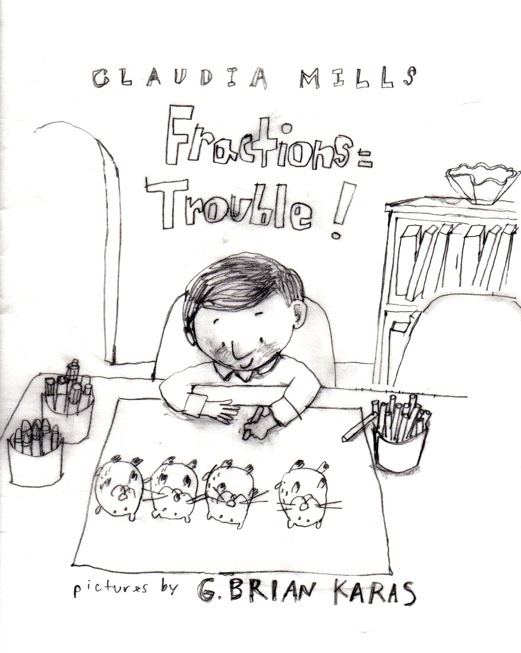 It does have an adorable cover, with art by G. Brian Karas. It does deal with a childhood rite of passage - mastering the times tables - that hasn't been given a book-length treatment before. I'm sure all that helps. But it's still a mystery to me why this book of all my others has turned out to be the little book that could. 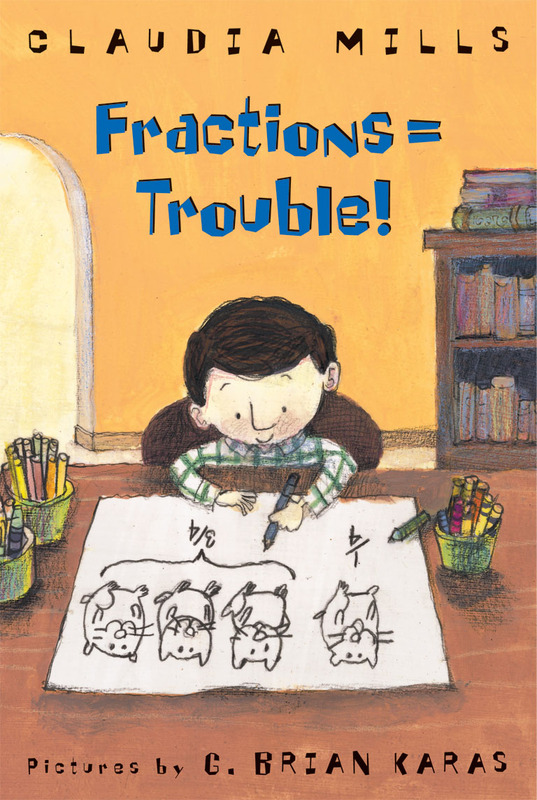 Now the sequel is coming out next year: Fractions = Trouble! Still a cute title, still an adorable cover, but this time Wilson is struggling with fractions, not times tables. Will that make a difference in its popularity? I'll know in a year or two or three or four. One of my departmental jobs in the Philosophy Department is to serve as our department's Teaching Mentor, which means that I supervise our graduate student instructors. Right now I'm in the thick of observing their classes and writing up reports on my observations. For the most part, our graduate students are not only good teachers, they are great teachers, often putting the faculty to shame with their passion for teaching and commitment to student learning. They tend to be pioneers for innovative teaching, creating unusual assignments (such as, in a course on Philosophy and Race, interviewing people to gather attitudes regarding racism, or requiring a service learning project that incorporates focused community service into the classroom experience,) or designing cool class websites. I sit in their classes, furiously taking notes, sometimes thinking, "I wish I could teach this material as clearly" or "Why didn't I think of that?" Where I'm critical of our graduate student instructors, it tends to be for not using the chalkboard effectively - oh, how I love the chalkboard! To me it is a proud feature of a professor to walk through the hallways of academe covered from head to toe with chalk. When I sit next to the students in the class, I see that they write down in their notebooks all and only what the instructor writes on the chalkboard, so it is crucial to write everything important on the board and LABEL it so that the student can look back at her notes and know exactly what that random list of words is supposed to be. Sometimes I also find fault with the kind or amount of work assigned - some teachers grade only on the basis of exams, but where will students ever learn how to write a college-level philosophy paper if not in a college-level philosophy class? Finally, sometimes I'm disheartened by the tone of a syllabus, particularly in its inclusion of a grim list of classroom policies for appropriate behavior and penalties for transgressing. My favorite syllabi are the ones that are warm and welcoming, inviting students in to the fascinating world of philosophy that we'll be exploring together this semester. One that I particularly liked began with the statement: "I am going to assume that you are all good students." Yes! That is so much better than a series of threats for what will happen if a student should text during class. I've given up on the texting issue myself. I don't know how to text, but if I did, I suspect I would be texting away under the table with the rest of them. I think great teachers are the ones who expect greatness from their students. And then, because they expect it, they are the ones who get it. I'm home from a delicious few days speaking at a Society of Children's Book Writers and Illustrators (SCBWI) retreat in Iowa, held at a hotel near the Amana Colonies. This is the first speaking invitation I've ever gotten from Facebook: the conference organizer, Connie Heckert, and I became friends over Facebook, I expressed enthusiasm for attending another one of her wonderful events, and then, via Facebook, she invited me to speak at this one. So Facebook is more than just tons of time-wasting fun! The attendees for the event - some 40 authors drawn from five states - were required to have three finished manuscripts to submit for critique. The bulk of the weekend was spent in critique workshops where we all exchanged comments on each other's work, the workshops facilitated by the retreat faculty - published authors (such as me) as well as editor Samantha McFerrin of Houghton Mifflin Harcourt, editor Julie Romeis of Chronicle Books, and literary agent Scott Treimel. At first I was a bit nervous about the workshops: oh, how to balance kindness and honesty, encouragement and incisive criticism! But the other attendees were so good at striking this balance that I just followed their example, and I think everyone left with truly dazzling insights into how to improve the manuscripts. The faculty also gave talks. Mine was a nitty-gritty craft-oriented one called "Manuscript Makeovers," where I gave guidelines for how to avoid all the many mistakes I've made in my own manuscripts over the years. The one I took the most notes on was an overview of the state of the industry by Samantha, Julie, and Scott. Here is some of what I learned. - E-books are happening faster than even the most aggressive predictions. New and very appealing picture book e-readers are in the works. Editors themselves now read all their manuscripts on their Kindles. This is "the most momentous change our industry has gone through since the advent of paperbacks." Editors are even working on books that will come to readers through email and cell phone calls! Eric Carle is about to issue "My First App by Eric Carle" ! - Electronic royalties remain a huge issue of contention between editors/publishers on the one hand and agents/authors on the other hand. The former make the same amount of money on electronic editions of books (lower price for the books offset by lower production costs); authors (and so agents) lose out. - The recent New York Times article that announced the impending demise of the picture book is "overstated and extreme." Yay! - Editorial office joke: "Vampires never die." But fallen angels are also catching on. Ditto for druids. - In the ever-cyclical rotations of the publishing world, it may be time for middle grade to come again to the forefront. Or dinosaurs. Graphic novels are still a wonderful option for this age group, especially for struggling readers. - For nonfiction, consider writing "a little known story about a well-known person." 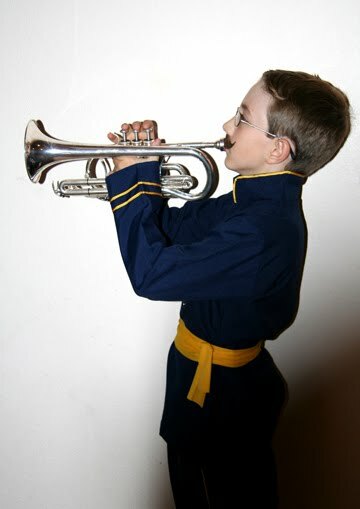 Or take a fresh angle, as in a recent picture book biography of Louis Armstrong told from the point of view of his horn. Oh, and so much more! My head is spinning! I think I could write a nonfiction book that would be a little-known story about a well-known person. But could I ever write an i-phone app?? In the Philosophy through Literature course I'm teaching, focused on the search for utopia, we've now finished reading three visions of utopia - Plato's Republic, Thomas More's Utopia, and Edward Bellamy's Looking Backward - and are on to the fourth - B. F. Skinner's Walden Two. The class is going well, I think, and I'm loving exploring these thought-provoking books with my students. But recently we've gotten stuck on one question over and over again, posed by several increasingly disgruntled students in the class, who are getting tired of all these arguments on behalf of "socialism." Their question is: why would anybody ever work or try to achieve anything if it weren't for the motivation of money? I've tried to defend Plato, More, and Bellamy, mainly because my style of teaching is generally to play devil's advocate and defend whatever book I'm teaching against whatever objections students pose to it. But I also find these students' bewilderment at how there could possibly be any non-monetary motivation to do anything frankly puzzling. There are so many other reasons to work! One is the motive of honor, which we talked about in class quite a bit in relation to Bellamy. People work for public recognition of their achievements. Even if all workers are paid the same, if some are promoted to positions of authority, or celebrated in other ways, this can provide a motivation to excel. Finally, though this is insufficiently stressed by these first three authors we've read, there is the motive of pleasure in the work itself: doing the work simply because you love the doing of the work for its own sake, and you love the satisfaction that comes from doing it well. I work for all four of these reasons. I do love money, of course I do, but if I had a choice between fame (honor) or money, I'd choose fame in a heartbeat, especially if all my financial needs were met by benevolent social arrangements. Public service is probably less of a motivation for me, but I do take on all kinds of service work for the philosophy department because, hey, somebody has to do it, and I'm a member of the department, so why not me? I do a lot of volunteering at my church for the same reason. But above all, it's the fourth motivation that drives me: working for the love of the work itself. I love writing. I love teaching - even (or maybe especially) when I'm challenged by these money-grubbing students! I don't love grading - nobody does - but it's the price I pay for all the other joy that comes from my job as a professor. And I love every single thing that has to do with my life as a writer. I even love addressing envelopes that are to be mailed to editors. I even love licking the stamps to go on them. So I say to these boys in my class: I hope you find work somebody that you'll do just for the love of it, and some community that you'll want to serve just because you care about it so deeply. And if you get some fame and fortune along the way, that's good, too. I have recently had the opportunity to step out of my comfort zone and put one timid little toe into the big scary world beyond the safe little life I have created for myself. The safe little life I have created for myself is an excellent little life, based on the four pillars of happiness - writing, reading, walking, friends - with every day carefully crafted to include five episodes of happiness, all governed by my favorite little mantras of happiness: "Be intent on the perfection of the present day"; "It if is to be, it's up to me." When I teach Epictetus the Stoic, my freshmen all have the same response: they don't want to live a life without emotion, and not just without happy emotion, but without sad, angry, scary, violent, passionate, disturbing emotion. They tell me they want all those things. I tell them that I wanted all those things, too, thirty years ago, but sadness, anger, fear - they all get old. You bang your bloody, battered head against a wall for a few decades and you start to think, hey, maybe this isn't, well, so very much FUN. Maybe there is a lot to be said for quiet, calm contentment. Maybe there is a lot to be said for restful evenings at home knitting in the company of a cat. But then recently I began to think that maybe my students, after all, were right. That there is this thing called being alive that we're called upon to do, however sad, angry, and scary we may feel as we do it. I thought I'd give it another try, maybe. One of my similarly older-and-wiser friends said I could chalk it up to practice at being alive. But now I'm not sure. I'm just not interested in anything except for happiness, just to be happy, happy every single day, happy walking through a beautiful mountain meadow looking at golden aspen trees, as I did yesterday with my friend Maureen, happy curling up to write another book, happy brushing Snickers. I'm going to go knit another row on my next little afghan square and think about all of this some more.